Before yesterday I had been sleeping till 8:30 or 9:00 (because I woke at like 4:00 and when I finally fell back asleep I couldn’t get back up). I decided the other day that even if I wake up at 4:00, I would just get up, have my coffee, and dig into God’s word. Maybe he was waking me up so early on purpose. So that’s what I did. Yesterday I woke somewhere between 3:30-4:00, and I got out of bed at 5:00. It was just what I needed. I started my day in God’s word, coffee in hand. I spent time in prayer and just journaling about everything that was on my heart. Well the same thing happened today, only I woke up at 5:45. Still early enough to have some time to myself. God really spoke to me and I thought I would share some of that. One of the things that I struggle with is whether or not the way I’m feeling is from mental illness, everyday life struggles, or sin that I am in that is keeping me in slavery. Last night I was having a “poor me” night. I was feeling alone. Feeling as if no one cared about what I was going through. Feeling as though I was insignificant and didn’t matter. Feeling as though no one would miss me if I wasn’t here (besides my family of course). Total self-centeredness. It was making me feel depressed. I automatically assumed my depression was sinking back in and I was going to have another bout of depression. God reminded me this morning that my feelings of depression and bad days/moments aren’t always from mental illness… sometimes they are just bad days and even sometimes they are from sin that is entangling me. I have been reading from the Life of Moses over at She Reads Truth. God spoke something to me that I’ve never understood before, and now some of my issues are making so much more sense. “After living under Pharaoh’s oppression for so long, enslavement had started to feel normal. It had become the everyday rhythm of the Israelites’ lives. They had forgotten what it means to be free. So God’s first step in freeing them was to make slavery even more unbearable. In His mercy, He lifted the veil from their eyes and made it clear: there was no future for them in Egypt. God does the same for us. His concern and love for us dictate that He use all means necessary to wake us out of the acceptance of our own slavery—to comparison and greed, lust and selfishness and joylessness—whatever it may be. In His mercy, God refuses to let us bear it any longer. Ouch. I really can’t even add much more to this except to say that I’m realizing my issues aren’t always about mental illness. Well, it’s back. The breathing issue that I dealt with a few weeks ago is back. I thought I had dealt with everything that needed to be dealt with, and I was wrong. Luckily this time I think there is a diagnosis. Kind of self diagnosed at the moment, but I’ll be talking with my doctor and counselor Monday and Tuesday. It’s called Hyperventilation Syndrome. There is so much information out there about it that I’m surprised none of the professionals I’ve seen knew about it. I saw a nurse practitioner, I talked with my psychiatrist over the phone, I talked with my counselor, and a friend that was a counselor and NONE of them had heard of this. I plan to take print-outs of the syndrome into my appointments next week. Maybe I’m wrong about what I think I have, but the symptoms point to this. The hardest part about it all is that it’s psychological. There’s something triggering it in my mind. There are some breathing techniques that can be used, but most of the articles state that counseling and medication are the best ways to over come it. The unfortunate part is I’m already on so much medication, so I don’t know if I’m ready to add just one more. The most common they say to help is an SSRI (which I am currently not on, but I have been in the past). Most of all, though, I think I need to get to the root of what is triggering it. One of the articles said it could take 6-8 weeks to overcome it. Last time, though, it only took a week and a half (of course it returned, so who knows this time). Several years ago this happened. It lasted from the end of May through the beginning of August. As I look back to that excruciating time, I see the trigger very clearly. I interviewed with the principal (at my kids’ school) in May, and had to wait till August to find out if she had any positions available for me. The breathing issue started in May, and it ended in August. To top it all off, I didn’t want to leave the preschool where I was working. Robert wanted me to work full time. And the prospect of being at the kids’ school was a good one. I did in fact get the job, only to have to leave at the end of January because of severe depression (ended up inpatient in the hospital). This time, though? I have no major trigger that I can pinpoint. It just doesn’t make sense. A few weeks ago I worked through some things that were causing me a lot of anxiety, and I’ve dealt with it all, so I don’t know what else there is to deal with. Other than this breathing issue, I’m so thankful for life. I love being with my kids all the time. I love homeschooling. I love living at camp; I love our community. Some people would say that maybe homeschooling is the trigger, but how can my favorite part of my day be a trigger for anxiety? I literally look forward to it every day. So. I just don’t know. Robert tells me that maybe it’s time I let go of so many expectations that I have on myself. He thinks it’s years of high expectations that I can not meet that have built up. If that’s the case, then I probably have a lot of counseling ahead of me to work through it. I also have some childhood and adulthood trauma that maybe I haven’t dealt with. It could be anything really. How some people go through the most terrible things in life and never have this kind of issue is beyond me. Why did I have to be the one to have this? I guess we all have our stuff and we carry it in different ways. I have been taking a nap every afternoon and it really helps. It kind of resets my breathing. The same thing happened today and I’m breathing great right now. I only hope that it stays this way. Only time will tell. In the meantime, please pray with me. It is a terrible way to live. It feels like I’m suffocating all the time. Yet I’m not. My oxygen levels are perfect, my lungs are clear, and nothing is clinically wrong. It’s just the way it feels. It’s the constant “need” to take a deep breath and the inability to do so. It’s like there’s something blocking the breath. It brings me to tears almost every day. I just want to overcome this. After all of my breathing issues last week, and after talking with friends with Hashimotos, I decided to get tested. I figured it could explain some of my extreme anxiety, weight gain (and inability to lose weight), fatigue, and mental health issues. I got the call this morning with the results, and I found out that I don’t have Hashimotos. So, apparently I really do just have bipolar with anxiety, need to eat better and exercise more, and am tired for various reasons. I’m kind of disappointed. I was really hoping there was a physical reason for my symptoms. Especially in the mental health area of my life. So today I’m just HATING being mentally ill. I was reminded of this when trying to decide on curriculum, yet again. I thought I had made a decision, and Robert told me to choose something that is sustainable on my worst days. I hate to hear that. I want to choose what is best for THEM. Not what will work for ME on my worst days. Then, I am reminded, yet again, that my kids will learn in spite of me. They will be fine, and our days will keep going even when I have to sleep till 9:00 because I didn’t sleep the night before. Or even when I’m depressed. Or even when I’m hypomanic. Or even when I’m anxious. Everything will be okay. No one has it perfect, and I have to remember that everything will turn out okay because God has called us to this place, this camp, homeschooling, and this season of life. I know that with Him, anything is possible. Without Him, I can do nothing. I’m thankful that homeschooling is something that brings me so much joy. My kids are learning so much even though all the boys are doing is reading, math, writing (journaling for the boys), and science (unit studies). Karis is also doing a writing curriculum (Essentials in Writing), spelling, and handwriting. We’re not doing history at all right now, and I’m okay with that. We’ll get there. They have so much time to be kids. They are imaginative, creative, spend lots of time outside, and spend lots of time together. They are learning to get along better, and they are learning that as siblings, they are each others’ best friends. They also have plenty of time to play with friends that homeschool here. Trampoline, cars in the dirt, bike riding, Legos, and crafts are among the many things that they get to do after school. 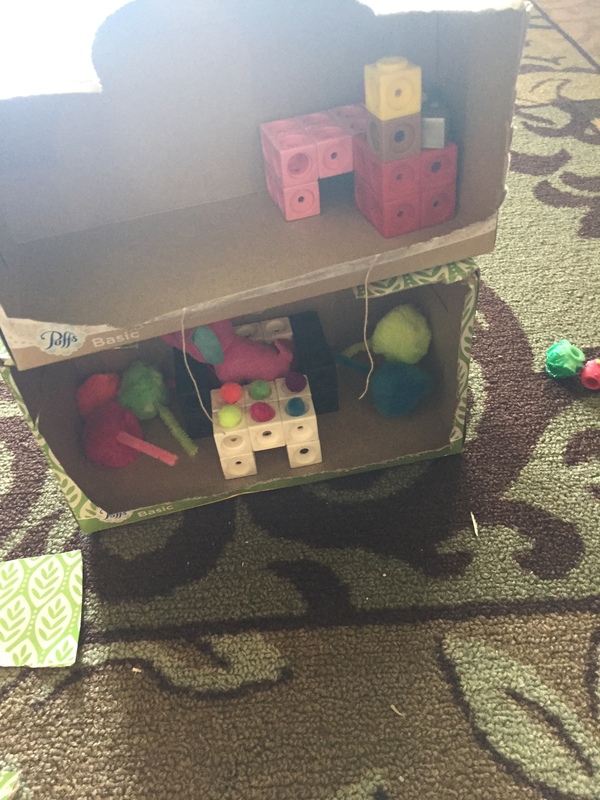 Today they built this out of tissue boxes, unifix cubes, and craft supplies. They had so much fun. Through it all I’m remembering one important thing that all my friends keep reminding me: Grace. God’s grace is sufficient, I need to give myself grace and give my kids grace. We are all in this together and we will learn and grow as a family as we face hard times. Through this reminder, I am also realizing that some of what I face is just what everyone faces. It’s not special because I’m mentally ill. Today I’m feeling fine with my mental health, I’m just struggling with life issues that lots of people struggle with. In the midst of it, life is good. I’m thankful for where we are and where we are headed. I’m thankful for my amazing husband and beautiful kids. I am thankful for the community that surrounds me, accepts me, and loves me despite my flaws. I am figuring things out one day at a time. God’s got this. His grace is sufficient. His grace is sufficient. In a lot of ways, so far, this has been “my year.” My bipolar is under control more than it ever has been. This is a huge victory. While I may have slight symptoms, they are not so bad that I can’t control them with coping mechanisms. I started homeschooling Karis in October and it was going so well that I knew I would be ready to bring the boys home next year. In true Courtney fashion, I spent hours and hours and hours and tons of money (thanks, tax return!) researching the PERFECT curriculum for my kids. I spent hours on websites looking at samples, placement tests, etc. I spent hours talking with people in homeschooling groups. I asked lots of questions, and I came to the conclusion that I had chosen the perfect curricula. During this “get away,” all I could think about was homeschooling and curriculum! It’s so terrible. We did enjoy some quiet time, game playing, naps, and great restaurants… but not without my mind constantly going and the need to constantly be talking things over with Robert. Fast forward to the past couple of weeks. I have been going back and forth, back and forth about some of the curriculum I have chosen (and already have). It’s all I think about. There are many curricula that I bought based on what others thought was best, and I didn’t take into consideration MY needs as well as the needs of MY kids. I have had a HUGE weight on my shoulders. After having a full week of breathing issues due to anxiety, I decided I needed to figure out what I need to do to remedy that. After going to a doctor yesterday to make sure there wasn’t anything physically wrong with me (and we decided that there isn’t), Robert and I spent a few hours talking everything out last night. When I told Robert some of the reasons for some of the curriculum I chose, he told me something that I needed to hear. I don’t have to do what everyone else says is best; I need to do what will work for ME. Just because someone else says it’s the right way for them doesn’t mean it’s the right way for me or for our kids. Then I told him that I’m worried about failing them. What if they don’t do well because of something that I didn’t choose wisely? All of this has been a huge weight on me and has made it difficult to just enjoy what we are already doing. Between Robert and someone else last night I was reminded that my children will learn in spite of me. Then I asked the question, what if what I bought doesn’t work? Robert and a few friends just said, then try something else. What if it’s not good enough? Robert then asked, “What’s good enough?” By whose standards am I measuring here? Are they learning? Are they enjoying learning? Are they thriving? I can say yes to all of those questions and we are only a month into it and we’ve kept it simple. Through all of this talk, I’ve decided to make changes (yes, again!) to curriculum for next year to simplify for myself and for my kids. They will learn and it will be great! I’m selling a spelling curriculum that EVERYONE says is amazing, but I just dread it and the kids don’t enjoy it either. And it’s expensive. I’m moving over to a more simple spelling curriculum (one that I’m currently doing with Karis). The one I’m moving over to is the one that the classical school used where I taught a few years ago. It is literally just an Evan Moor Building Spelling Skills workbook. But. They learn the rule for the week at the beginning, copy/cover and spell, word meaning (not just how to spell it, but what the word means), word study (digging deeper into the rule for the week), editing for spelling, then a spelling test (if I choose) on Fridays. So far using this method, Karis has made mostly 100s on her spelling tests. I’m selling a writing curriculum (Essentials in Writing) that I bought for the boys that they’re just not ready for. It’s expensive as well. I bought a less expensive grammar and writing that has them doing things the more classical way. It’s simplifying everything. They will be doing copywork, dictation (me reading to them and them writing it), and narration (reading and telling about it… summarization). They won’t be expected to come up with their own narrative, informational, poetry, etc. The curriculum that I’m selling is GREAT for older kiddos, but they’re not ready for it yet. So, I’m going to continue using it for Karis. We’ll see what I do for the boys as they get older. One other thing I’m learning. Take. One. Year. At. A. Time. I had everything planned out for many subjects all the way through high school in my head, and I’m learning it doesn’t work that way with homeschooling (or for anything really). I absolutely HATE that I have anxiety. I’m still not breathing 100% because the “wheels” are still turning so to speak. I know that once everything is sold and settled I will probably feel better. For now, I just breathe in and breathe out. Rest. And take the meds necessary to feel okay. One of the questions that I’ve had in my mind (and I’m sure other people are thinking but are just not saying anything) is that maybe with my mental illnesses I shouldn’t be homeschooling. But I have come to some conclusions. One: I don’t have any other choice. I will NOT send them back to the school they were in (many, many reasons), and we are over an hour from town. This is our life. Two: I have to learn how to overcome difficult situations. I can’t live my life scared of my mental illness. Three: With homeschooling year around, we can take it slow. If we need to take a day off, we can (which we did, today!). We can even take a week off if we need to! Most people take 3 months off for summer so a day or week here or there won’t hurt anything. I am confident that we will get through this and I we will get into our groove. One step at a time!